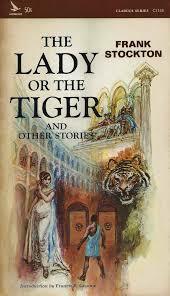 The Lady and the Tiger's ending is one of the most widely debated pieces of literature the world has seen. It's a literary masterpiece that leaves us on a cliffhanger, so of course the world is obsessed with the answer. Now if you've never read the Lady and the Tiger click here. Okay, now you should be up to speed. 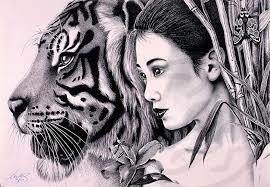 The Lady and the Tiger is considered the choice between jealousy and love, which would you choose? I've decided to theorize about what I think happened after this story. Right off the bat, it is mentioned that the princess is semi-barbaric. She isn't some sweet fairy princess who will do everything for love, but she's probably too smart to be overcome by jealousy. So the only thing left is to think rationally. This may seem a bit farfetched, but I think that she chose the lady for her lover. Not because she wants him to be happy and alive, but because she needs him alive for a plan and can't do that if he is ripped to shreds by a tiger. There are just more options with him still living. Let me just exaggerate the semi-barbaric part. Okay, now that that's done, time for my theory. I think that the princess would have killed her father, because he was standing in between her and her lover, if he lived there was no way they would ever be together. So he needs to go. And then she hatches a plan to kill the lady. Now it would be vital that these deaths not happen very close together in time, it would seem like to much of a coincidence to be ignored. Now I don't know much about how the politics of this story work, so I don't know if she would be able to gain power, or if she would just be the daughter of a dead barbarian king who had no rights. Either way, the plan could work. If she was in power people wouldn't want to deny her what she wants, so if she wanted to marry her lover who would they be to tell her no? And if she was just the daughter of a dead king, then it wouldn't really be important who she marries anymore. She would be fit to marry whoever she wants. A possible flaw would be if after her fathers death she would be forced to marry the future king, you know, to keep royal blood in the family. But once again, I don't know much about the politics. Really, my point is that things aren't always black and white and you have more options than you think, as evident by this theory. I liked the authors message though. Trying to get you to think things through and get you wondering what you would choose if put in the same place.